PETA (People for the Ethical Treatment of Animals) does not approve. Do they have a leg to stand on? This is not the first time PETA has disapproved of politicians killing bugs, and PETA does not target republican bug-killers exclusively. They were also upset with Barack Obama’s fly-swatting. Remember that? He probably did it without thinking. Some people put the spider outside, but spiders are often scary to people, and that can prevent them from pondering their worth. In a nutshell, our position is this: He isn’t the Buddha, he’s a human being, and human beings have a long way to go before they think before they act. Anyone who thinks or ponders about the value of bugs will conclude that killing them is wrong. Chris Christie and Barack Obama killed bugs. Therefore, Chris Christie and Barack Obama have never thought about the value of the lives of bugs. As to the reason PETA gives for why Christie and Obama have not thought about the value of the lives of bugs? They’re scared of them. As a moral argument for not killing bugs, this begs the question. As a descriptive explanation for why people kill bugs, it’s a failure. I’ve encountered people with arachnophobia before. When these folks encounter spiders, their inclination is not to smash them, it is to run away screaming in terror looking for someone else to smash them. No, this account of why people kill bugs is not satisfying. I also do not think it’s fair to say that people kill bugs because they haven’t thought about it. I have written a series of different posts about animal welfare in which I have given the value of the lives of animals, including bugs, serious consideration. Despite this, I continue to come to the conclusion that it is perfectly acceptable (and in some cases, such as malaria-stricken Africa, morally required) to kill bugs. I’m not here to make fun of PETA for disagreeing with me, but to point out a serious flaw in their approach. There are a lot of thoughtful people who do not agree with PETA, and instead of dismissing all contrary views as by definition not thoughtful, PETA needs to engage in dialogue with those who disagree with it. The range of views on animal welfare is massive. I know a committed vegan who nonetheless does not object to bug-killing due to evidence she has found that has persuaded her that, unlike other animals, they are incapable of feeling pain in any conscious, meaningful way. 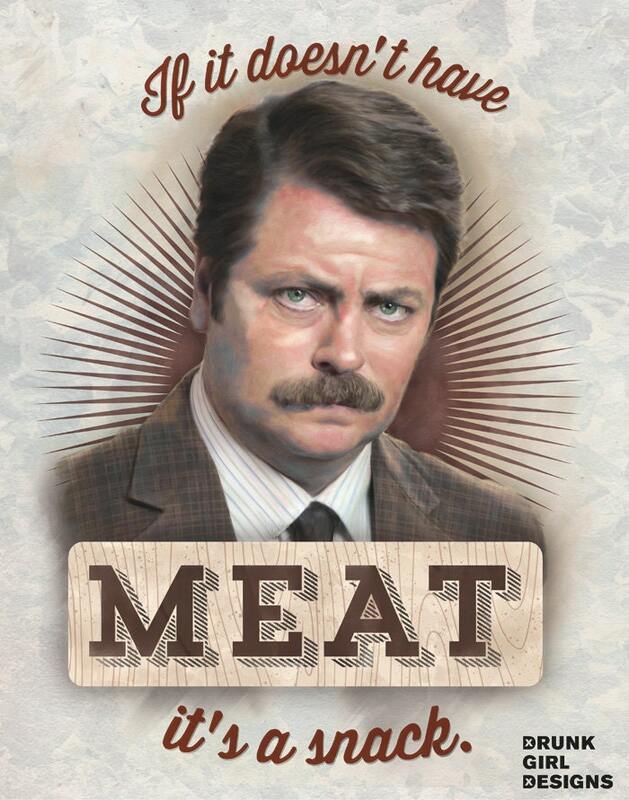 By slandering everyone who does not embrace their platform as Ron Swanson incarnate, PETA only alienates its opponents and inclines them to behave more like Ron Swanson. Every hunk of meat becomes an act of defiance against the oppressor, every squished bug a symbol of freedom. Reciprocity–bugs do not contribute to our moral community, so we have no moral obligations to them (my view). Self-Defence–many bugs bite, sting, and spread deadly diseases, so we may kill them to protect ourselves. Pain–bugs cannot feel pain as we do and consequently cannot suffer. Sentience–bugs are not properly conscious beings and so have no value. Sapience–bugs do not possess higher intelligence and so have no value. Property Rights–when a bug invades the lawful property of a person, that bug forfeits its right to life. Anthropocentrism–human beings are the only morally significant life forms; the mere fact that bugs displease us makes it permissible to kill them. Religion–a deity gave the world and everything in it to man for his use. Bugs are consequently man’s property, and he may destroy them. Some of these views are pretty silly. I definitely don’t agree with 6, 7, or 8, but a person could think about animal welfare and still hold those views. Numbers 3, 4, and 5 all have significant support among thinking people. Many of us believe it is permissible to kill human beings in self-defence, so number 2 is definitely plausible. As for number 1, I’ve written about that quite a bit, and I think it’s a very good view. But rather than defend its view against these critiques or engage with them, PETA prefers to dismiss all of us as “not thoughtful”. How thoughtless of them.